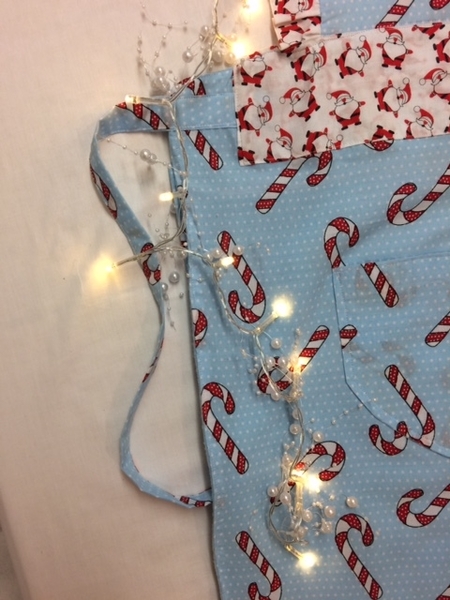 Candy Cane Apron; Traditional vintage style apron fully lined including a front pocket, with a generous waist straps for when the cook is sampling the goods before serving dinner. 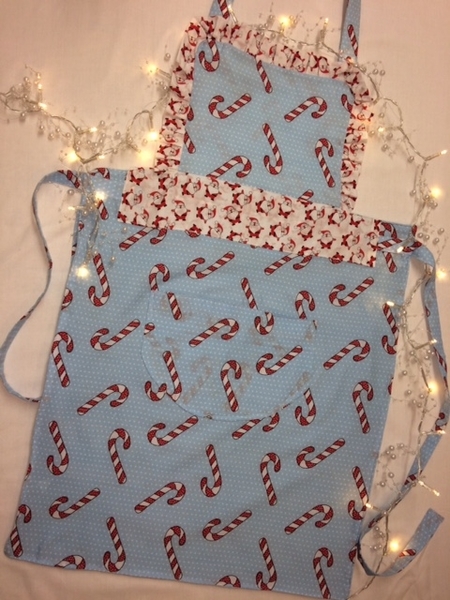 This apron is a perfect present for a ‘Yummy Mummy’ or a ‘Dishy Daddy’ or even a ‘Gorgeous Grandparent’. size – L: 73 cm W: (bib) 28 cm W: 45 cm (lower apron) straps 25 cm. Got a question? Message Dimples. There is a 10 day returns policy full refund- cost of returns is paid by buyer due to the size of the business. Items must be returned in the same conditions as when shipped out. 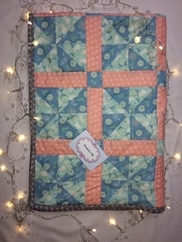 Baby Snuggle Quilt; 100% cotton with 'Warm and Natural' wadding which is also 100% USA grown cotton - this is reflected in the price. Beautiful bunnies and soft thistle down pattern fabric is perfect..
Hand/home crafted: Original design, childs reversible apron. Fun, funky and functional! 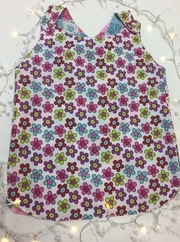 This craft apron is beautiful on both sides, on one side is gorgeous strawberry print fabric with a fashionable..
Hand/home crafted: Gorgeous dress with a small floral print. The colours are a combination of blues, pink and purple with yellow and green � all working together. The shoulder buttons are pale yellow..
Hand/home crafted: Swing dress. Gorgeous strawberry print fabric is ideal for summer days or brightening up winter with a long sleeve top underneath. 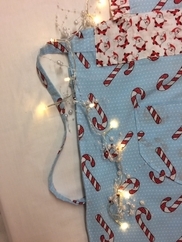 The dress has a button and loop fastening at the..
Hand/home crafted: Child crossover apron/ tunic. Bright, beautiful and fun fabric, vintage �seventies style floral print with beautiful patchwork effect lining with pinks, blues and white florals and..
Costal inspired backpack/rucksack. 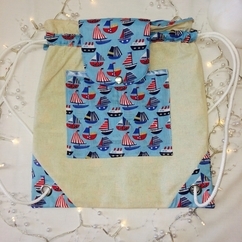 made with quality calico and nautical themed pocket, flap and trim. The fastenings are chrome colour press studs with matching eyelets. the nautical theme is reflected..
Hygge quilt, this quilt is pure �Hygge. 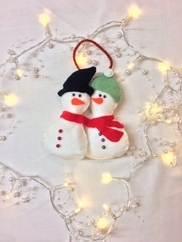 It is warm and comfy, perfect for snuggling under on cold winter nights and long car journeys for the little ones in the back. 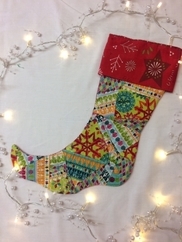 Its Scandinavian prints complimented..
Jazzy Patchwork Stocking; This stocking is for the more discerning! The stocking is slightly smaller, maybe for the small but expensive gift? Although the pattern and fabric are not quite traditional..
Gorgeous Nordic Santa Stocking; Appliqued Santa is too cute hanging his holly! 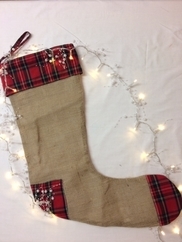 This stocking is fully lined with tartan topper and generous hanging loop. If you look close you can spot the sparkle snowflakes..
Beautiful Scandinavian Pattern Tote Bag; The bag is fully lined with fashionable grey Nordic tree pattern fabric. Ideal for delivering presents to friends and family � environmentally friendly, reuse..
Hessian stocking; Vintagesque traditional style hessian stocking is fully lined and slightly oversized for the all of those who are on the �nice list. 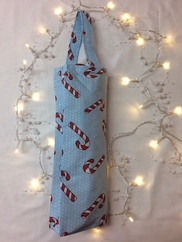 There is a proportionate hanging loop � so this..
Candy Cane Bottle Bag; Fun and bright, fully lined with sweet Christmas pudding fabric. 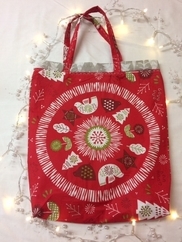 Perfect for �Secret Santa � two gifts in one, a bottle and a super fun bag. The bag can be reused time and time..